Seawind condo, beach resort home in Gulf Shores. Unit 903 at Seawind was just completely re-furnished - all brand new! It is simply gorgeous and so incredibly comfortable! !The kitchen has beautiful solid wood cabinets, granite counters, and stainless steel appliances...it is fully stocked with everything you need to enjoy your vacation. A very large laundry room is found off the kitchen with a full sized washer and dryer. You will find extras throughout this condo including a beach cart stocked with a few sands toys, 6 beach chairs, and an umbrella to use during your stay! The living room has plenty of comfortable seating with a huge 55” SMART HDTV!. The living room overlooks the beach and has access to the gulf front deck. The dining room table sits 4 with more seating found at the kitchen bar.The Master Bedroom and Guest Bedroom both feature king sized beds! All furniture in this condo is new!!! The master bedroom has access to the large gulf front deck! The ‘bunk room’ features a full sized bed. All bedrooms, living room and bunk room are equipped with Smart HDTV’s with access to NetFlix. The master and guest baths are both large and very luxurious with granite counters. The sofa pulls out to allow for a total of 8 people, if needed.The large gulf front deck features three sitting areas! A love seat with coffee table, a tall bistro table, and 2 comfy club chairs!! 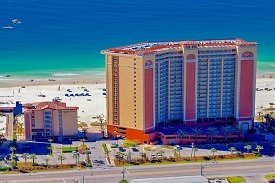 Seawind Condo Rental in Gulf Shores AL.